Hi friends, did you know you can make caramel from something healthy? Yup. You guys know I love making decadent-tasting recipes that are actually healthy. And I have a winner for you today! 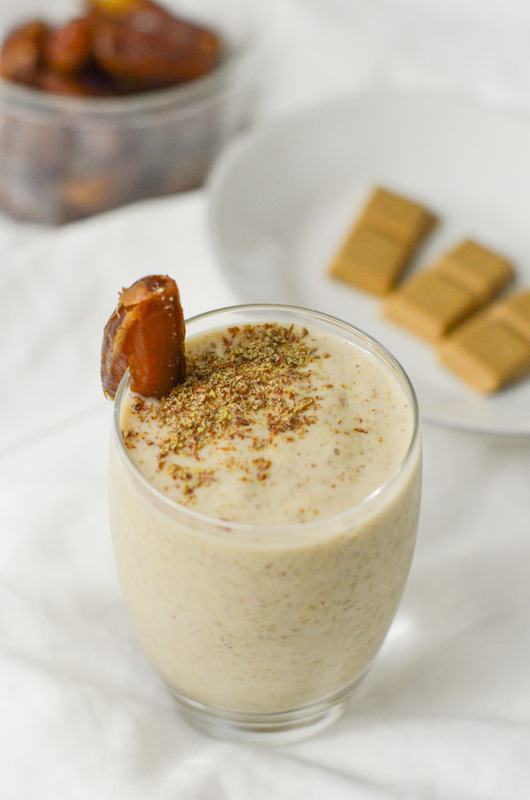 I’m sharing a Healthy Salted Caramel Smoothie Recipe. And guess what? There’s no added sugar! Yup, we’re going to make this little treat with fruit. Salted caramel has been a thing for like…forever. But I don’t know what hit me the other day, but I was craving the rich, sweet caramel taste paired with a salty twist. It really is an amazing combo. The thing was…I wanted to see if I could do it in a healthy way. And guess what? You can. I did. And it’s not that hard. I’ll show you how you can too! You only need a couple common ingredients. The trick is making healthy caramel. The solution – dates. Yes. Dates. Have you heard of date caramel? It’s a thing. This blogger put date caramel to the test in case you’re curious about straight-up date caramel. 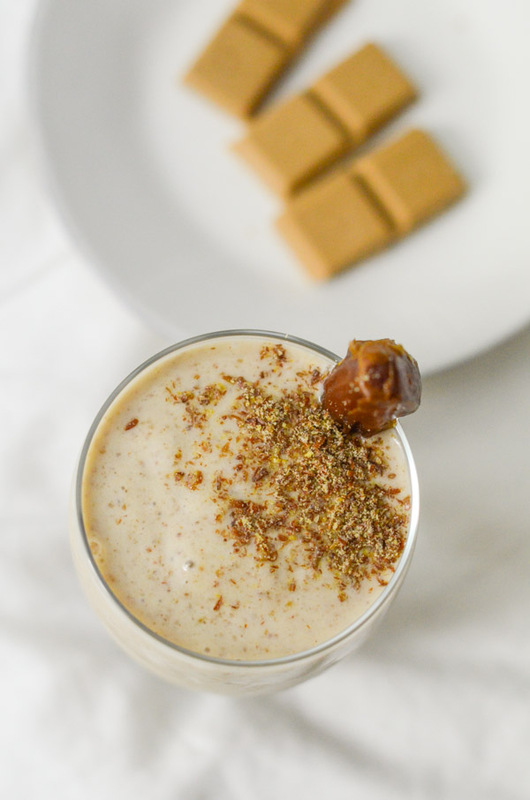 But today, we’re just using the flavor profile to bring this Healthy Salted Caramel Smoothie Recipe to life. Think about it. Dates have a natural caramel-y flavor. So all we need is a few more ingredients to smoothie-fy this. So now that we have the caramel flavor figured out, what else do we need? Salt. Duh. But also some health-boosting ingredients to bulk up the smoothie. I mean you don’t want a cup of salted date caramel only, right? Banana is my go-to smoothie ingredient because it provides volume and natural sweetness without a lot of flavor. This allows the taste of your other ingredients to stand out. Add in some non-dairy milk, and I think we have it folks. You can also add a spoonful of nut butter if you want to expand the nutrition profile and/or make this a bit more filling. Up to you! Oh and I added in some ground flaxseed to amp up the nutrition value. But it’s totally optional. I usually have some in my freezer, so it’s easy to add into smoothies. 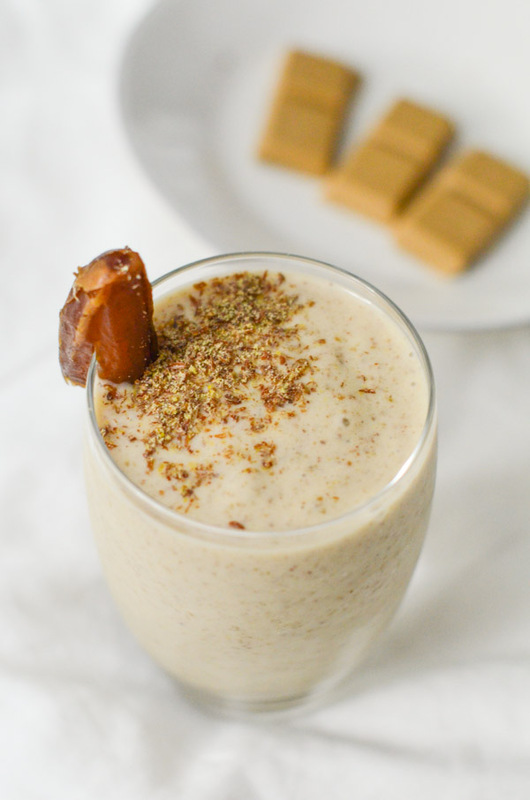 Did you know you can make a Healthy Salted Caramel Smoothie Recipe without added sugar? You can make it with health-boosting ingredients. I’ll show you how! 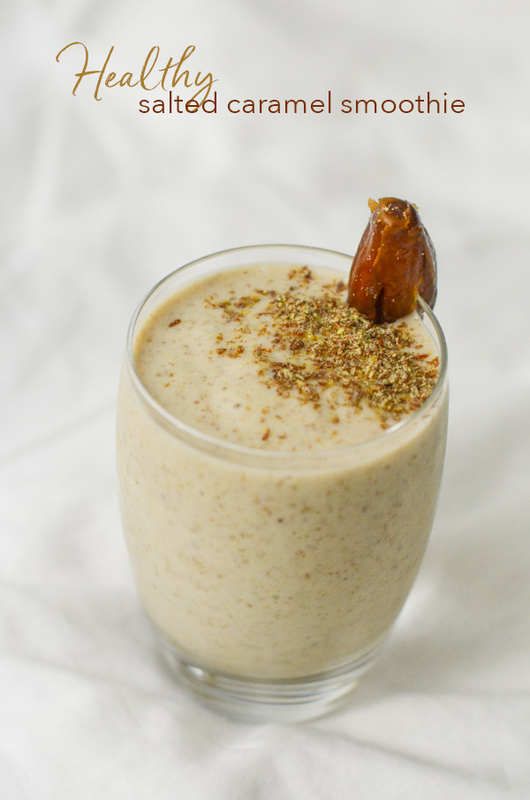 Place bananas, milk, dates, flaxseed (if using), nut butter (if using), and salt in a blender. Cover and blend until ingredients are processed and smooth, about 1-2 minutes. Optional: garnish with a sprinkle of ground flaxseed and a date*. *To garnish with the date, remove the pit and put a small cut into the bottom end of the date, about halfway through the date (vertical). Slide the date onto the edge of the cup. Thanks for reading! 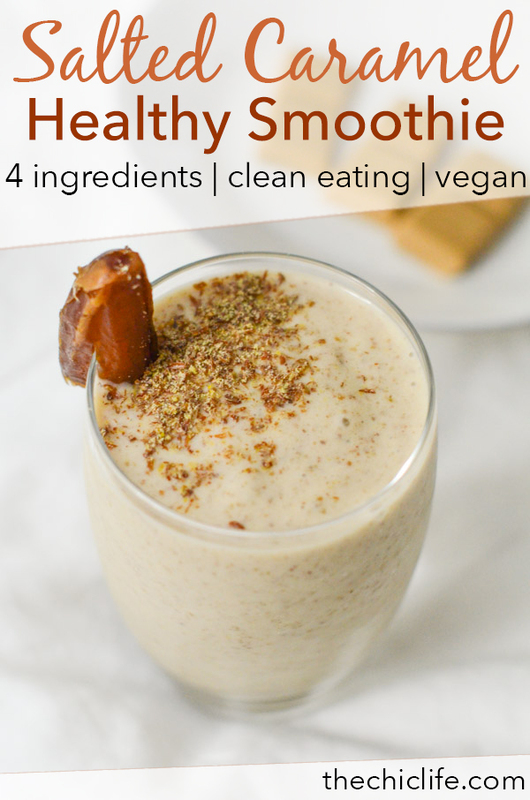 Hope you enjoy this Healthy Salted Caramel Smoothie Recipe! If you do, please consider sharing it with your friends and fellow sweet tooths!